Please note that this current website does not have a shopping cart. To buy our Inuit Snow Goggles online, please go to our e-commerce website at NaturalExotics.ca. 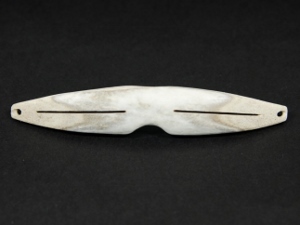 These are Inuit made snow goggles. The snow goggles are hand carved from caribou or moose antler with a natural leather strap or black cord. They come in various styles and sizes. Please see genus and species information and export restrictions in the gallery.